Check out the thoroughly charming Brooks Ashmanskas in this behind-the-scenes video from the recording sessions for the original cast recording of the Broadway hit musical', The Prom. You may recall last November, the production made news when their performance on the Macy's Thanksgiving Day Parade ended, as it does in the show, with two females leads kissing. He and several Broadway colleagues head to Indiana to take up the cause of a high school student being bullied over taking her female crush to the prom. And then, as they say, hilarity ensues. 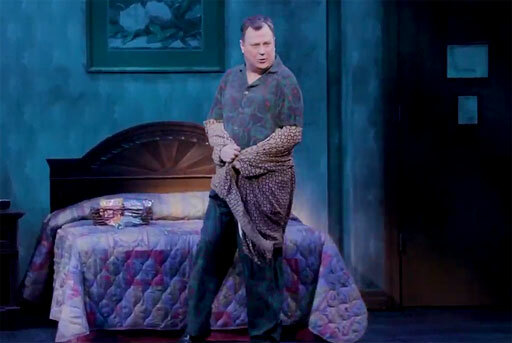 In reviewing the show, The New York Times praised Ashmanskas, a Broadway veteran of over a dozen productions on the Great White Way (The Producers, Sunday in the Park with George, Promises, Promises), for threading the needle of playing an over-the-top gay character without offending. Quite the contrary, The Times says his flamboyant character stylings "somehow wind up as poetry instead." This song comes as the young high school girl, nervous to head to the prom, asks if he would go with her. Barry, who never went to the prom himself because he was self-conscious as a young gay, is thrilled as he sings, "Barry Is Going To Prom." "Who cares if you're a big old girl, just get into that gym and twirl!" You can find more info about the musical here. Watch below and enjoy.